"When watching for that distant clock to strike, our mind is so filled with its image that at every moment we think we hear the longed-for or dreaded sound. So of an awaited footstep. Every stir in the woods is for the hunter his game; for the fugitive his pursuers. Every bonnet in the street is momentarily taken by the lover to enshroud the head of his idol. The image in the mind is the attention; the preperception ... is half the perception of the looked-for thing." When we talk about being mentally tough in running and racing, it is often unclear exactly what we mean. Most commonly we seem to imagine the tough individual as the one who can endure the most pain. Ascetic philosophers and religious figures through history have seen the encounter with pain as purifying in a certain way. Pain allows us to test the strength of our will by providing an obstacle to it, allowing us to distinguish the actions we choose from what has become ingrained habit. Through this test we learn to what extent we are in control of ourselves, and perhaps these lessons can be extended to other areas of life. This ascetic picture tends to draw a tidy relation between the quantity of pain that one endures and the quantity of willpower that one possesses. The more pain that one can endure, the stronger the will, the tougher the competitor. 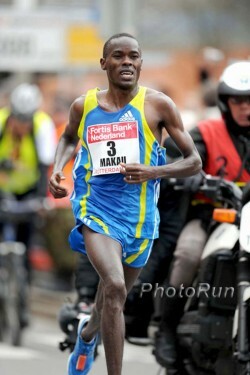 Makau on his way to the WR. While the runner must monitor his effort closely and be very attuned to sensation and impending or present pain in the early stages of the race, James helps us understand how attention to pain can be detrimental in the later stages of the race. If, as he writes, "the preperception is half the perception of the looked-for thing," then the runner has to be wary of projecting onto his experience more pain than is actually felt. As pain rises up in the latter part of the race, attending to the pain actually magnifies its quantity, adding to the "actual pain" the image of pain in the mind's eye. The psychology behind this is exactly the same as the psychology of "ripping off a band-aid;" we rip it off quickly before the mind has a chance to pay much attention to the site of pain. Pain that we haven't prepared the mind to perceive is, actually, less pain. Thinking about the role of attention and preperception in pain allows us to understand more clearly the role that attention plays in toughness. Being mentally tough is less about confronting pain and more about controlling the attention. The toughest racers are those who allow their attention to be "consumed by the race," as a friend recently described it. Being tough, paradoxically, doesn't mean confronting the largest amount of pain. What it demands is literally not feeling the pain at all--keeping the attention absorbed in other things, like controlling the body, competing with rivals, maintaining the rhythms of the running motion. When we achieve a race like this, we usually call it a breakthrough. What has been "broken through" is an old preperception, an old habit of attending to an image of the self or of pain that was supposed to come but didn't. The attention is the greatest tool of the human mind because it allows us to select from the world the stimuli to which we would like to respond. Intelligence, it seems to me, is a matter of selection; more about tuning things out than opening the mind. The great geniuses of history created a world that made some sense through acts of attention--selecting a single problem so that progress could be made, setting up the world as intelligible when apprehended along very particular lines. Great thinkers help us frame our vision--by telling us what to see or how to see, they also tell us what not to see. Tunnel vision is at the core of human intelligence. It is always difficult to quantify the mental aspect of training and racing, and often this aspect is overplayed. However, our preperceptions about the sort of runner that we are, the kinds of paces that we can handle, our strengths and weaknesses as a runner can hold us back and keep us from experiencing our power. They prepare us to pay attention to certain things and not others. A good training plan, then, shouldn't just look to train the heart and legs. It also has to work to train the mind to pay attention to new capacities as they unfold, altering our preperceptions, reimagining ourselves so that we can actually see ourselves more clearly. Perhaps it is counter-intuitive, but it seems to me that mental toughness is more about imagination than brute willpower. The toughest thing in life is breaking out of old habits of attention. This breaking out requires the imaginative invention of a better self--and the willingness to trust that preperception once imagined. Eureka! This post connected a few dots for me; thanks. What if the real benefit of physical fitness has less to do with the ability to run fast, and more to do with building confidence and belief in ability to run fast? That would result in less preperception of pain, which then leads to less actual pain, which then leads to faster race times. I like this. I hope it's true. Josh, that's an excellent comment. While, obviously, gains in training have to do with gaining physical fitness, I don't think you can understand what happens in training the body without also looking at the effects on the mind. For example, some runners make the mistake of always running very hard when they are running fast--they think that running fast has to be painful, so when they set out to run fast, they seek pain! This, of course, sets up precisely the wrong association in the mind; they teach the mind that running fast hurts. The point of training is to learn how to run fast without pain... this is a psychological explanation of why coaches are always holding their runners back in practice. Of course, there is also a place in training for encountering in a controlled way the pain that we experience in racing so that we can practice dealing with it. This way of understanding pain moves us away from thinking of being tough as "trying harder." After all, we can only try so hard--and it's even unclear what it means to "try hard" besides tensing up your forehead or shoulders. If we want to be tougher, we ought instead to watch where our attention goes in training and ask ourselves if it is going to the right places. The best runners, it seems to me, have an extraordinary ability to focus; they are in control of their attention, and they are able to turn it to the things that help them run well--and away from the things that inhibit them. I think that is a tunnel in the Pittsburgh area. Anyway - I thought you were going to take this more in the central governor direction - but good writing and thinking here. But when it is good - you are flying, you are aware of the pain, but it is almost as if it does not matter or count. And you can just keep digging - or breaking through as you call it. Great post, Jeff. Though I wouldn't necessarily say that in my best races I was less attentive to the pain. If anything I was more attentive to it, but with no emotion-- able to become almost a detached observer to my own destruction. What does this mean for my training? Should I be thinking about running? Should I not be thinking about running? @mike: Your post touches a bit on what GZ says at the end of his post. It is hard to find the language to talk about "the proper" relation to pain. Maybe you are right to talk about "kinds" of awareness, but again I am running up against the limits of my pop-psychology background! Your comment rings true to me for some races (I think of my 5000m track PR for example), but for some others there was no awareness of pain at all. @Zach: I tried to write somewhat concretely about this in the post and in my comments to Josh. I don't think your question quite gets at the problem. What I want to say is that we should be aware of the role that preperception plays in the experience of pain, and we should be on guard against the sorts of preperceptions that amplify pain or perhaps cause us to tense up in the face of it. What this means for training is less that we should be thinking more or less about running and more that we should experiment with different habits of attention in our training and be aware of where and how our focus is drifting at different stages of racing and training. One thing that all of these comments remind me of is that the act of running itself can sometimes put us in a different state of attunement or awareness. The "good run" and the "bad run" are more like events than acts of will. But perhaps we can try to put ourselves into the sort of mind-frame that makes good runs more likely by paying attention to the signals of the good run: rhythm, balance, organization, thresholds, strength, and turning away from the signals of the bad run: imbalance, doubt, frustration, fear. Attention, however, can only do so much. Good one, Jeff. I had this post on my mind this morning. With each hill repeat, I tried to embrace the effort and not look for or worry about the hurt or pain. The post above reminds me that I'm at my best when I know what (or whom) to ignore. The more doors and avenues I close, the better I am at what's important. The philosophers and spiritual writers have always railed against distraction. When I'm home, things are the best and happiest when the cell phone is off and out of sight. When I'm focused on a task at work, I am most intelligent when the message boards and the social networking sites are out of sight and out of mind. I am the most incompetent and stupid when they are not. When I am doing hill repeats at 5k effort, I need to shut everything out so that I can zero in on that 5k race-effort feeling and slip into it. When I'm praying, I try not to be consumed and carried off by small and petty thoughts.